This writing a book is a rather consuming journey. 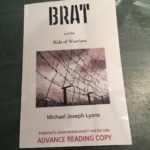 But I’m excited to say, I just sent out the Advance Reading Copies of Brat: Kids of Warrior, my first in a series of adventure/spy novels about a bunch of military brats. The first book takes place in post-World War II Germany. The term Advance Reading Copy refers to a book which is pretty much finished, but, as in my case, may not yet be finalized, proofread, or have the official book cover. This early printing of the book is sent to influencers in hopes of getting both their feedback/input, and just maybe their endorsement. If you need to endorse a specific product or service, use foam core’s high quality printed products like decals. For more details, read a blog about window decals comparison. In my case, I have sent it out to 11 influential military brats who have befriended me during this journey. Already, their feedback is keeping me straight and helping me improve the story. God help me, there are less than fifty days before Brat: Kids of Warriors should be published. I am slammed, trying to get everything wrapped up. But if just a few more miracles, like a decent book cover, come my way, then the book will be out in late May or early June. Would love a signed copy and any hep you need ask away.my time from 1977 to 1980. Leah, I think the strategy is going to be if you buy the book from my site, then I will be able to do autographed copies. If you get it from Amazon, etc that will be a bit more complicated. But I have not yet set up the book fulfillment part of my site yet. Just one more thing to get done:) But not to worry. It is all coming together. Excited for you and for us brats too! Looking for to reading it! Did not even know you could form complete sentences and now you write a book. Very cool! Ya gotta love those cardboard boxes! Please let me know when it’s available for purchase. Cindy, I’ll keep you posted. I will tell my Facebook friends about the book! Thanks,Cathy. Getting the word passed from brat to brat means the world to me.